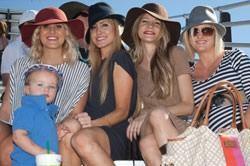 With premier sideline parking almost sold out and “The World’s Greatest Polo Party” a little more than a month away, it’s time to ensure your place at The 6th Annual Bentley Scottsdale Polo Championships on Saturday, November 5th at WestWorld of Scottsdale. General Admission tickets are $10 less in advance of the event and provide access to all four polo matches, the Cultural Concert, fireworks, car displays and other amazing event elements, including the Mark-Taylor Residential Living Room. 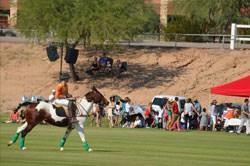 The Bentley Scottsdale Polo Championships has something for everyone! For a nice day out with the family enjoy FREE admission for kids 12 years of age and younger. Bring a blanket and sit out on the grass or find your spot in the bleachers or at a picnic table – there’s tons of family fun including The Canine Couture Fashion Show, a Santa Claus for some pre-holiday fun and picture taking, and even a hole-in-one contest by Troon Golf that all can partake in. 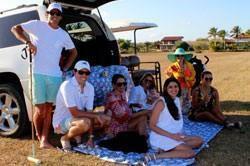 Check out the Triyar Ivy League Lounge, there’s nothing like it in the world of polo. Don’t miss the ultimate party experience on-site brought to you by Downtown Scottsdale’s Premier Night Club and Entertainment experts. Dance to music by our amazing DJs. Sit field-side with any of our great sideline ticketing options. For General Sideline Parking just drive your car field-side and enjoy the matches. Spots are first-come, first-serve on event day. Elite Sideline Parking is one of the best perches in Arizona sports. A spot will be reserved with your name and you can enjoy the match from THE center-field tailgate spaces. 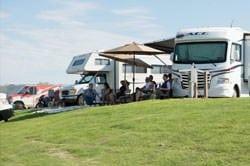 The RV Day Pass – roll in, hook up and enjoy. Sit along the elevated road and look down on all the action of the day’s matches. All sideline tickets include general admission for all passengers. Can’t wake up before noon on a weekend or already have daytime plans? Purchase one of our Twilight tickets – they’re new this year. Our General Twilight Ticket provides admission after 3 p.m. and gives you access to some of the day’s most exciting events, including the new Women’s Sunset Polo Match, the inaugural Cultural Concert and the Fireworks Finale. Twilight Tailgating provides you the same access at 3 p.m. to the end-of-day events, but instead of scrounging for a spot, pull up field-side and enjoy The Polo Party’s new elements from your car or lawn chair, or park your ride and wander the grounds to see everything the event has to offer. 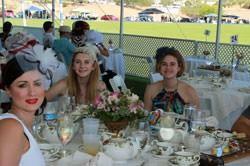 Get a seat in the shade and enjoy some of the best service and most luxurious tents at The Bentley Scottsdale Polo Championships. All VIP tents, excluding the Phoenician Afternoon Tea & High Society Tent, provide a complimentary bottle of Veuve Clicquot Champagne with purchase of a table. The Molina Fine Jewelers Drivers & Players VIP Lounge has it all – the best location and complimentary food and cocktails. Get exclusive access and mingle with drivers and players. The Barrett-Jackson Champagne & Jazz Lounge offers the only champagne bar on-site. Enjoy mid-field seats and complimentary mimosas through half-time of the first match, and one complimentary mimosa thereafter. The Phoenician Afternoon Tea & High Society Tent allows you to experience afternoon tea like never before. Known throughout the country for its exceptional presentation of this culinary tradition, the AAA Five Diamond resort is making it a party. Enjoy a true English full-tea service, including an assortment of fine blends and a multi-course menu featuring hand-made finger sandwiches, scones with Devonshire cream and preserves, and gourmet pastries. 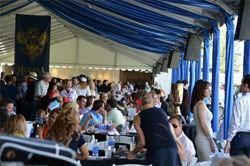 Experience a beautiful art auction in The ArtPolo Pavillion by J. Levine. Enjoy covered tent field-side seats and exclusive access to the Valley’s most interesting live contemporary and fine art auction. The tent will have a no-host food and beverage service. Sign up to consign a piece or to bid by emailing contactus@jlevines.com. Can’t make up your mind? Purchase the All-Access Pass. Get reserved seats in the Molina Fine Jewelers Drivers & Players VIP Lounge, VIP parking, and exclusive access to all ticketed tents on-site. For more information and prices on tickets, tables and tents visit ThePoloParty.com/tickets-tables.